Barford won the toss on a hot, sunny afternoon that was made for cricket, and chose to bat first. Opening with Paul Johnstone and Richard Johnson to confuse the opposition we set off at a fine lick scoring at just over 3 runs an over (that is quick for us!). PJ was the first to fall to a leg before decision when on 28. He was replaced at the wicket by Ben Griffin who scored 11 runs from 19 balls upping the run rate until he was unlucky to be clean bowled! Then the mighty Sandy Pierson came to the wicket – slight in stature but big in heart – to beat the living daylights out of the opposition bowling… Johnson, quietly accumulating his runs, was out to another leg before decision on a handsome 39, his highest score for Barford and Peirson was joined by James Beaven, who also batted like a demon to fall with an important 22 runs to his name. Peirson, the rock on which the innings had been built, battled on, but changed tack and started hammering the opposition bowlers around the ground. Joined by the overly hirsute Harrison who managed to get himself out by not hitting a ball he was given out for hitting (sorry SD) scoring a measly 6 runs. Simon Hawkins joined the immaculate Peirson to take the final score to 163 with Peirson making an excellent 25 not out. A truly match winning performance, but was it? Tim Jolly led the bowling onslaught with a maiden over. Sharing the initial attack with Ben Griffin bowling his slower deliveries, the opening batsmen played carefully with Griffin’s second over giving Barford their first wicket. 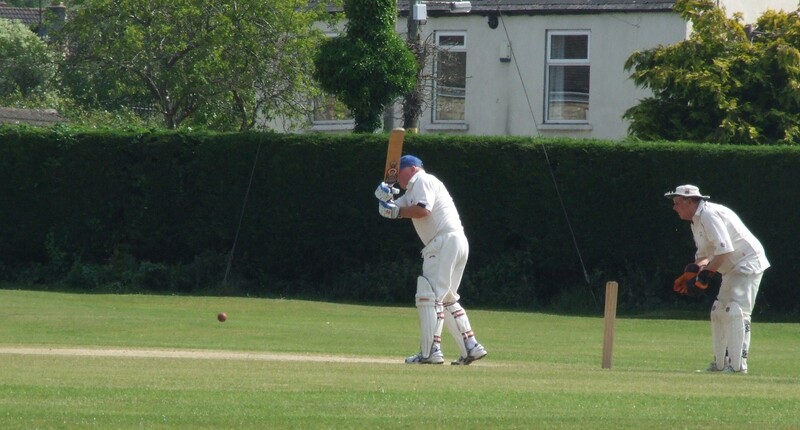 James Beaven then joined the bowling attack with Paul Johnstone and the batsmen began to raise the scoring rate. After two overs from Johnstone, Richard Jones began to mesmerize the batsmen, however the scoring rate rose again. After twelve overs the opposition had reached 65 with the loss of just one wicket. It was then that Harrison came into the bowling attack and took two important wickets in his first over that was also a maiden. Johnson now came on to bowl with Harrison but the tide had not yet turned. The score rose to 114 for three from nineteen overs. It was then that the captain brought himself on to bowl – it was only to change bowling ends for Jones but the batsman mistimed a shot that went straight into the reliable hands of Griffin to take an excellent catch. Jones then resumed from the other end and the captain had his second and last over taking another wicket with the last ball. After 20 overs in the searing heat, the “tired and emotional” Sandy Peirson retired to the bar with Will (super sub) Perry taking over the gloves. Simon Hawkins came on to bowl superbly and he and Tim Jolly swept up the remaining batsmen to take Barford to victory by 18 runs with the opposition batting for only 30 of their allotted overs. Simon Hawkins had the record books in his sights with two wickets in two balls only for the hat-trick ball to be propelled somewhere near first slip. The highlight of the game was James Beaven’s brilliant catch but the memorable moment was seeing two ancient cricketers running five to a shot that didn’t quite make the boundary rope. The whole contest was overseen by Simon Drage who was superb with his counting and always made sure the overs were limited to six legal deliveries….